There are several methods of hanging the feathers. The plans have one method, Frank Justices instructions have another. I mixed the two and came up with my own. And I really like it. 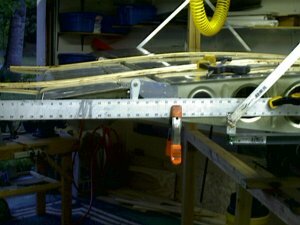 The key for me was getting the wing horizontal in the jig. Once horizontal at shoulder height, it becomes very easy to work with. Having a wooden jig helped a lot in terms of its ability to have things screwed into it. Here is the wing up horizontal, with the straight edge giving me a reference line. 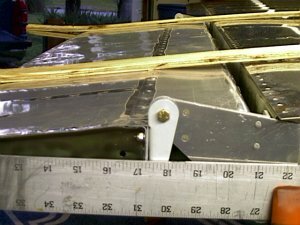 I used 1/2 ply wood strips, 2 inches wide, for alignment to the airfoil. I did not use the templates that were part of the shipping crate. Mainly because I did not want to keep them around the shop taking up space. These strips worked just fine. 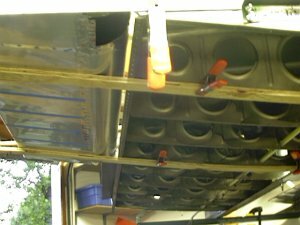 Here is a view of the underside. You will notice a nice view of the inside of the wing. Here is a close up of the aileron bracket. I cant tell you how nice and easy it was to have this at shoulder height while working on it. Having the wing hanging vertically requires you to roll around upside down to work on the feathers.